Let me just tell you that these past few weeks have been CRAZY TOWN! 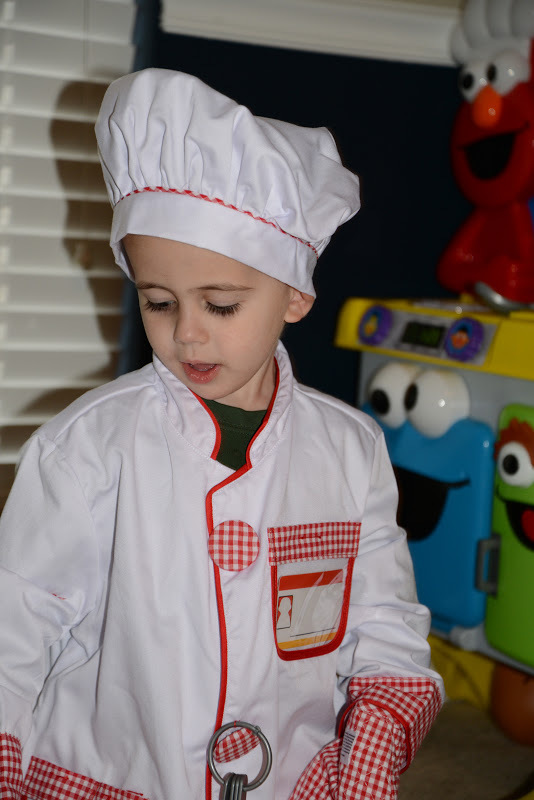 Between Halloween, sick kiddos, report cards, 50th Day fun and conferences, I'm about ready for a turkey break. For the past two weeks I've been cleaning up after sick babies. It's been all kinds of yuck, but I think we're finally healthy. Everyone go knock on some wood for me. 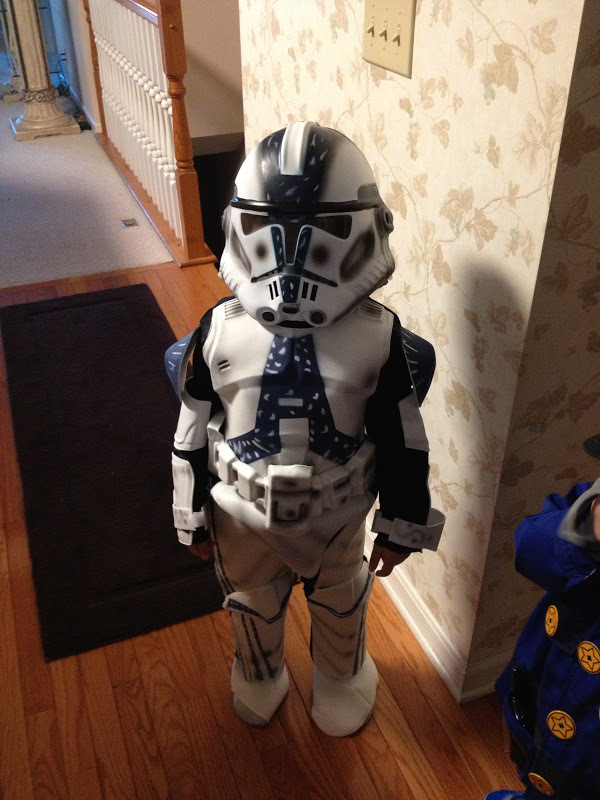 My poor little Landon had to miss Halloween, but we've made up for it in the costume department. 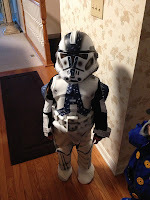 The day after Halloween we went a little crazy and bought all sorts of costumes. 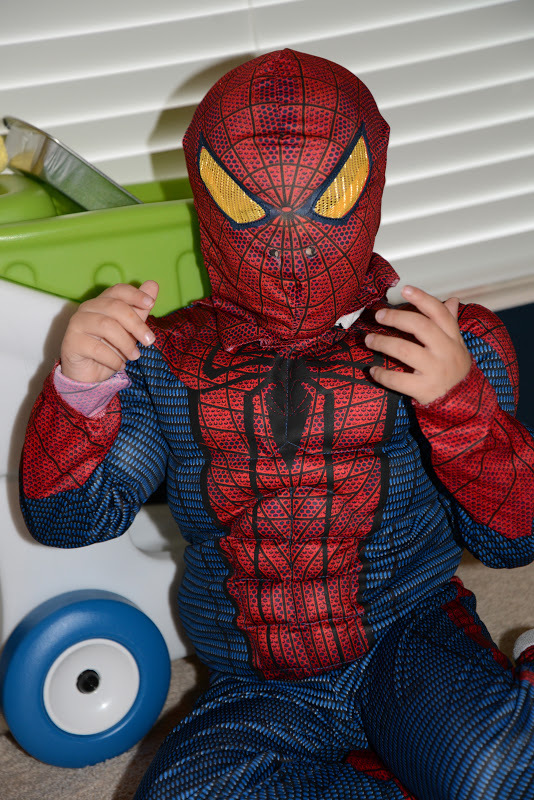 My boys have been dressing up in different outfits on a minute to minute basis. 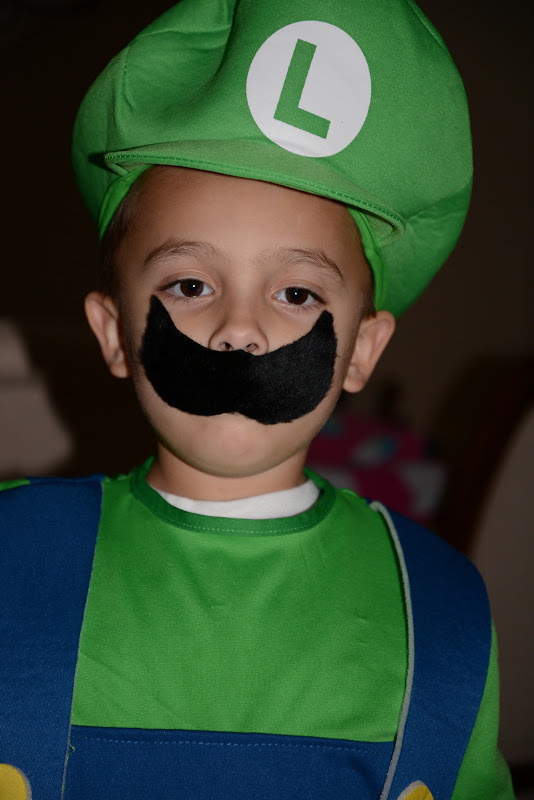 In a matter of a half-hour Drew had been Luigi, a police officer, Iron Man, Spider Man and a Storm Trooper. 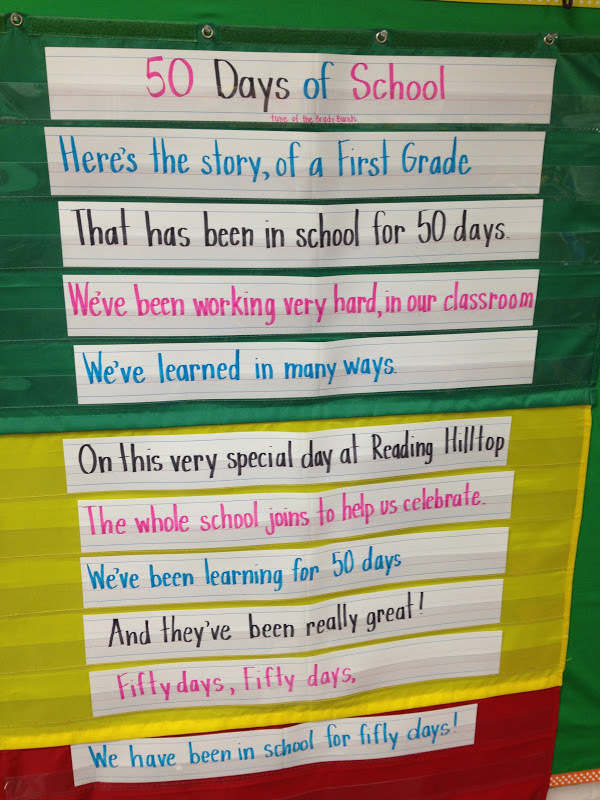 This week we're celebrating 50 Days of School. 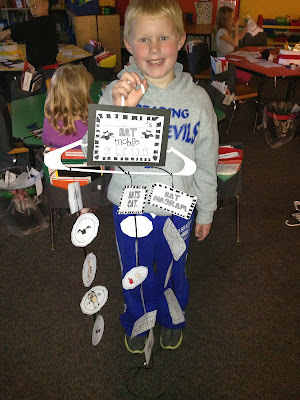 Cara's unit is one of my favorite TpT purchases ever! I have had lots of emails about how I decide the theme for the week and how my themes work. At the beginning of the year we looked at Ohio's Core Science and Social Studies standards and decided how we would cover these standards through units of study. When we choose a theme, everything (except reader's and writer's workshop) is planned around that theme. For instance, this week is the 50's. One of our standards is learning about how people lived in the past and comparing it to today. 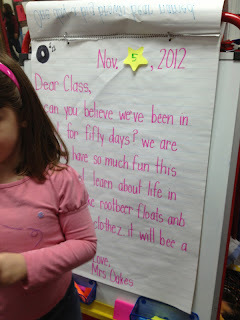 We start our day with a morning message that has been written with the 50's in mind. Then we read a poem that goes with the theme. Later in the day we do a interactive writing about the 50's and what we're learning. Then, our centers for the week match the theme, as well. To me, it just makes it all cohesive and makes learning make sense. I hit a bunch of the reading and writing foundation's standards while I'm teaching the science and social studies content. For instance we might find punctuation in the message and poem. Or we may look for words that have digraphs. I can't wait to post some of our fun activities. In addition to Cara's activities, we also took a look at a "Now and Then" Power Point I made, and watched an episode of Leave it Beaver. It was a great way for the kids to see black and white T.V., the use of a typewriter, how kids were in school, eating dinner in dress clothes with fine china, etc. You can find the episode here. Next week we'll learn about The First Thanksgiving. 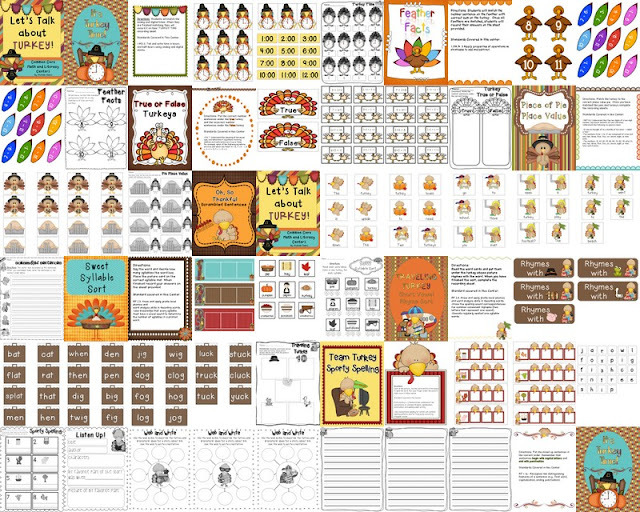 We'll use a nonfiction poem about Thanksgiving, and we'll be using my new Let's Talk about Turkey Centers that are all based on Common Core Standards. I'll post more about my Thanksgiving plans soon! You can check out my centers below. There are 4 math and 4 literacy centers, plus a listening center sheet and 3 writing webs and writing paper templates. Now, onto writing. My school does Writer's Workshop and use Lucy Calkins' units. Now with the common core, some of the units, such as poetry unit, no longer fit, therefore we are currently working on writing narratives by looking at story elements. We first talked about characters, how authors develop characters and how characters use dialogue. We are now learning about how every story has a setting, and that good writer's show their setting through their words. 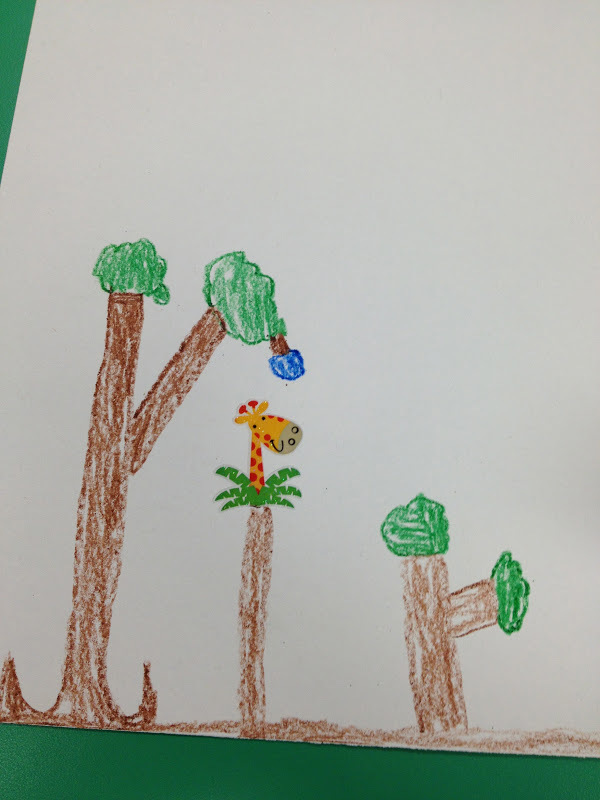 Today we introduced setting and then students were given an animal sticker. 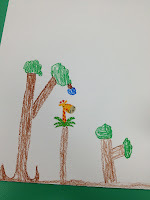 The students were asked to use that sticker and create the setting where that animal would live. This was my teaching partner Ashley's idea and it was genius! The kids really understood setting. After about 5 minutes, we ended the activity and I told them that their reader's should be able to read their story and draw a similar picture just by reading their words. We read a book and discussed how the author developed their setting. We'll continue to look at literature and the ways authors show their setting through words. They are doing an awesome job! We'll move on next week to beginning, middle and end. We'll also discuss problem and solution in future lessons. I think it's important to remember that the new common core standards for writing are all really based on showing literature and using great mentor texts to model writing, not so much prompt writing. Just having students write to prompts doesn't model good writing. Students need to be able to write narratives, opinion pieces and informative writing based quality literature. So using literature to teach good writing and responding to literature is the best way to hit those standards. Lastly, in this long, long post, I wanted to say THANK YOU! So many of you have commented on products you have purchased and your kind words make me smile. In the past month I've received several comments that made all of the stress in my life fade away in a few sweet sentences. I have been sharing on my site and or blogging for 12 years. You'll never know how much it means to hear kind words. If you are one of the following people who left these sweet comments, please let me know. I would love to give you a little gift or thank you. And to all of you that read through this super long post. Thank you. Thanks for following me, reading and sharing your time and teaching with me. 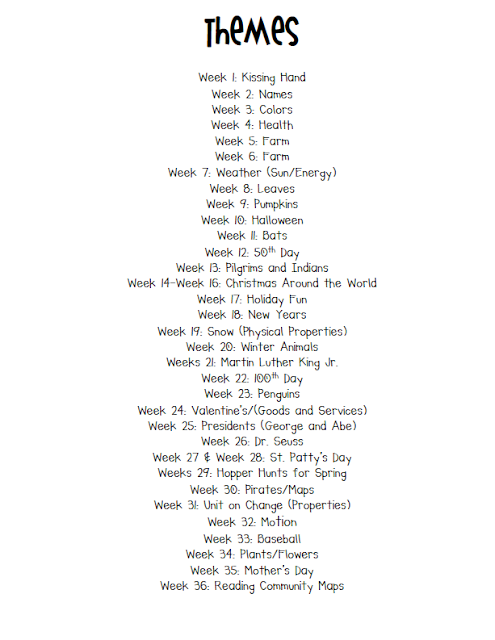 I was out doing some first grade blog hopping and needed to tell you that I found your THEMES list very useful! I am in the process of making one now! I also adore your anchor charts! I do not draw very well but your posters give me inspiration! Thanks! This is a great post. It's unfortunate that your explanation of themes and Writers Workshop were misunderstood by a reader, but your response was clear and no apology is necessary. I understood your message and think your ideas are wonderful. Thanks for this post! I am the only first grade teacher at my school and seeing what is happening in other classrooms is SO helpful! The themes list, pictures of student work and anchor charts, and your explanations are wonderful! I am the only first grade teacher at my school too Katie.. it is so hard! Not sure what I would do without blogs like Michelle's! Thank you so much for all your posts and personal responses to questions that I have sent through email! You have been so helpful! 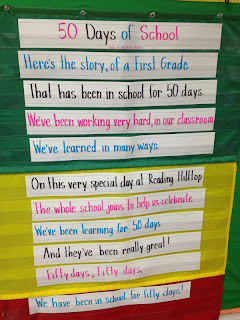 Like Katie I am the only first grade teacher at my school and it really helps to see what is going on at other schools! 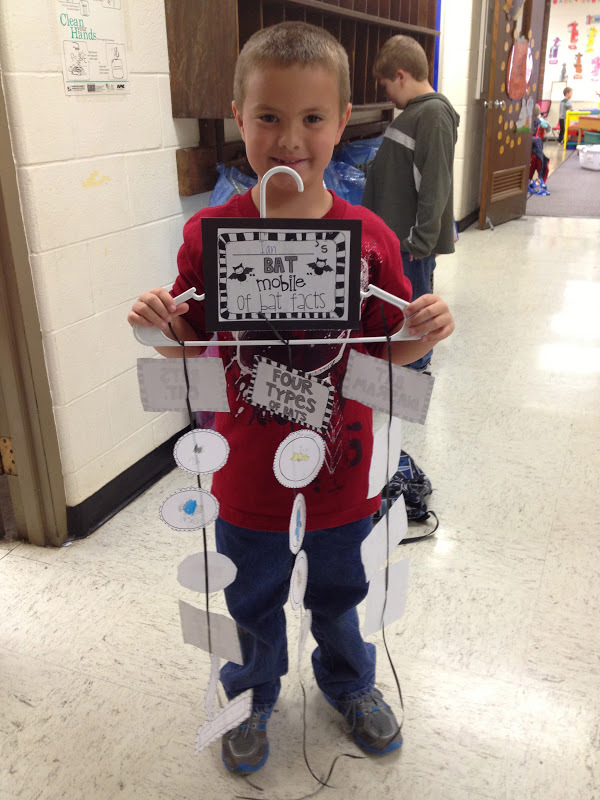 I have been using your centers and my kids LOVE them! I even started using a "weekly" instead of daily morning message and it has really cut down on my stress! Thank you!! Great post! I do not currently use Reader's or Writer's Workshop, but I am trying to learn more about it and hopefully can use it next year! My school is currently looking for writing curriculum, and we have looked into Lucy Calkins' units (the CCSS aligned version is coming out in the spring!). Do you like the units? Would you recommend them? Thanks! 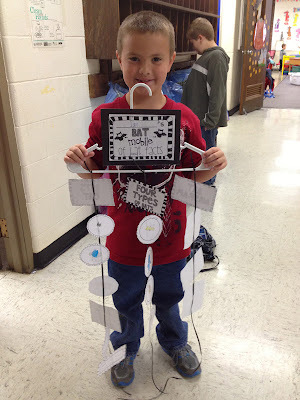 Hi Michelle - I love all your anchor charts and those bat mobiles are stinkin cute. It's FRIDAY!!!!!! Have a great weekend. Oh my goodness, Michelle! You are truly a gifted teacher and God has blessed you so much. I am in awe of all that you do. This is my 2nd year teaching 1st grade and I am excited to use your layout of the year in themes to help me plan my activities. If your looking for a new blog to follow, hop over to this newbie's blog. It's humble, but I'm slowly figuring it all out. Big fan of yours!